Don’t make any plans to travel. You’re not up for that. Sure, the idea of spending four consecutive winter days at home with your kids may sound daunting, but you’ll make it. Don’t try to get invited anywhere either. If you go to someone else’s home, you’ll just spend the afternoon chasing after the toddler, or keeping an eye on whoever is supposed to be chasing the toddler. Consider inviting people over, but don’t follow through. It looks like Thanksgiving is just going to be your family of four. Let go of any lingering fears that this is a sign you’ve become a social pariah. There’s a turkey in your freezer, so you’re all set on that front. Delay the unthawing process because there’s no room in your refrigerator. Tell yourself that the cold water submersion process will work just fine. Don’t even consider beginning any of your cooking projects until you’ve gone for a long holiday run. Get drizzled on and smell the wood smoke. Listen to the frogs; say hello to the llamas. Tell your wife to take the toddler out visiting so that you can make a pumpkin pie with your older son. Remark on how enjoyable the day has been so far. Get the turkey in the oven more or less on time, even though the toddler has woken up way too early from a nap, and he insists on being held. It’s hard to prepare a turkey with one hand. Dismiss your concern that the inner cavity still felt partially frozen. Watch the house descend into chaos right around five—an hour past the time you had hoped to eat. For some reason, though the potatoes and salad are ready, the turkey stays at 140 degrees. Consider hopefully that maybe your thermometer is broken and start carving at the turkey. Realize it’s not your thermometer; the turkey is raw in places. Tell your older son that yes, he can decorate the dining area. Take note that “decorating”, to him, means spreading blankets on the floor and piling every stuffed animal he owns on top of them. Try to remain calm as the toddler promptly dismantles these decorations, and both of your sons wind up hitting each other and in tears. Try not to take it too personally that your older son won’t eat Thanksgiving dinner because he’s too busy screaming in his room. Try to understand that those decorations were, for whatever reason, very important to him, especially the unsharpened pencils that he laid at every place setting. 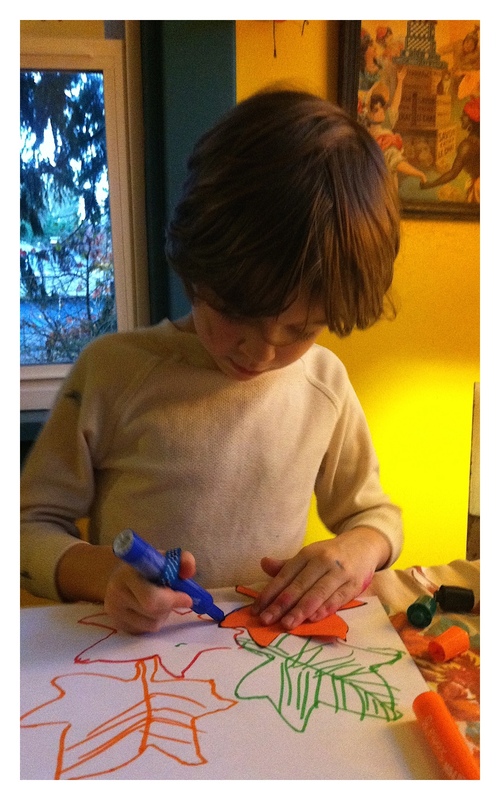 Consider that someday he might be a world-renowned decorative genius and then this moment will make more sense. Try not to make a big deal out of the fact that you spent half of the day cooking and now no one can really eat. Remind yourself that holidays are weird. They just are. Find consolation in the fact that your son more or less gets over himself and eats two servings of mashed potatoes. Follow his instructions when, between dinner and dessert, he asks you to sit on the couch with your wife. He has a card to present. 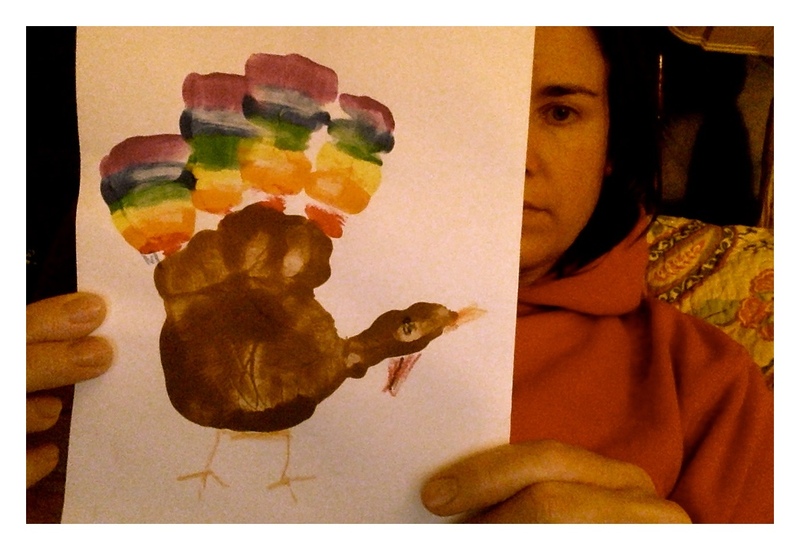 It’s a classic of sorts: one of those turkeys made from a handprint, with a Thanksgiving poem inside. He made it in kindergarten. Fawn over it. Remember that you’re all supposed to say what you’re grateful for. No one gets too creative, and that’s okay. You’re all just grateful for each other. Even the toddler gets in on the spirit, rattling off everyone’s name. Whip some cream. Eat some pie. Decide that this holiday has been no better and no worse than the vast majority of holidays you can remember. I love this. Such a combo of sadness, frustration, humor, and love. Maybe that’s what holidays just are? Ours was very quiet, no turkey, just the 2 of us, trying not to feel deprived. I hope the follow-up celebration made up for it, Mom! There was no deprivation. Thanksgiving just came 48 hours later this year because we lost power. I’m with Carole Berney. That’s likely just about what holidays are. You’ve captured it here though with such a combination of wry humor and pathos. So you ended up with a great card and a lovely post. Bravo, Mama. Well played. i loved the description of your recent holiday, when we are here I want to be there!!! i don’t want to miss a thing and sadness comes over me, even though we had a wonderful time at K and J, its not the same as being with you and K ,even with all the chaos of two little ones ,you manage to see the brighter side ,yes I’m thankful for so many many things but having you in my life is just grand. Sounds like wonderful family time 🙂 We did a vegan gluten free theme to accommodate our dietary restrictions. Vegan and GF sounds great! Honestly, I’m always pretty sick of traditional Thanksgiving food well before the leftovers run out. Thank you. When we decided to have a second child, I promised myself I’d do less chasing around other people’s houses, i.e. not go anywhere for a while. And did you follow last year’s advice this year? I love this piece; it’s so funny and touching at the same time. I laughed out loud many, many times, knowing the children as I do. Thanks! I did follow my advice. We had a pretty mellow holiday. I hope you had a good one too! I loved reading it again this year. It is a holiday classic, and just in time.